Dama Academic Scholarly & Scientific Research Society formally came into being registered to operate by the registrar-General’s Department and serves as an ideal professional platform for both the established as well as budding authors for getting their research’s published at an earlier date. Since inception (in 2016) we have believed in providing high quality research work at reasonable prices. 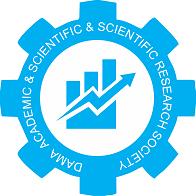 Dama Academic Scholarly & Scientific Research Society is an international platform for researchers, inventors, scientists, engineers, managers, doctors, and professors involved in all streams of research with the purpose of publishing high-quality research and review papers. Dama Academic Scholarly & Scientific Research Society offers research papers, authentic surveys, and review papers by researchers from various fields and facilitates communication between distinguished individuals who have significantly contributed to the development of the research community. The content includes original research and innovative applications from all streams of knowledge, including science, business, medicine, technology, and sociology, and thus promotes better insights into the state of philosophy and the latest trends in technology. Dama Academic Scholarly & Scientific Research Society presents unpublished materials which are subjected to a rigorous evaluation with an exceptional review at the discretion of our meritorious Editorial Board. Dama Academic Scholarly & Scientific Research Society is a premier research paper publisher with a global reputation for publishing quality journals and services which cover all streams. Our internationally recognized publishing program incorporates wide array of disciplines from computer science to management and medical sciences.